Housing advocates rightly remind us that the federal government provides much more housing assistance to well-off households than it does for the low-income households who actually need support to have a roof over their heads. As the housing crisis in the Los Angeles area worsens, with record numbers of people unable to find even minimal shelter, we decided to investigate how much federal housing assistance is coming into LA County — and where it is going. There are five major areas of federal housing assistance. Four are targeted at low-income households: Housing choice vouchers, Low-Income Housing Tax Credits (LIHTC), project-based Section 8 housing, and traditional public rental housing. The much larger, fifth budget item is the assistance that benefits middle- and high-income households, the Mortgage Interest Deduction (MID). The MID is an accidental tax loophole that is extremely regressive — in 2017 almost 90 percent of the deduction went to households earning more than $100,000. In addition, scholars believe the MID actually reduces homeownership by inflating housing prices. We found that the nearly one million households in LA County benefit from the MID — five times more than the combination of the four programs targeting low-income households (Figure 1). The MID is an entitlement program, which means that everyone eligible for it can benefit from it. Programs aimed at low-income people such as vouchers or the LIHTC are appropriated with funding limits, meaning many people who could potentially benefit are left out. The National Low Income Housing Coalition estimated that in the Los Angeles-Long Beach metropolitan area, more than one million low-income households are eligible to receive some form of federal housing assistance but do not. 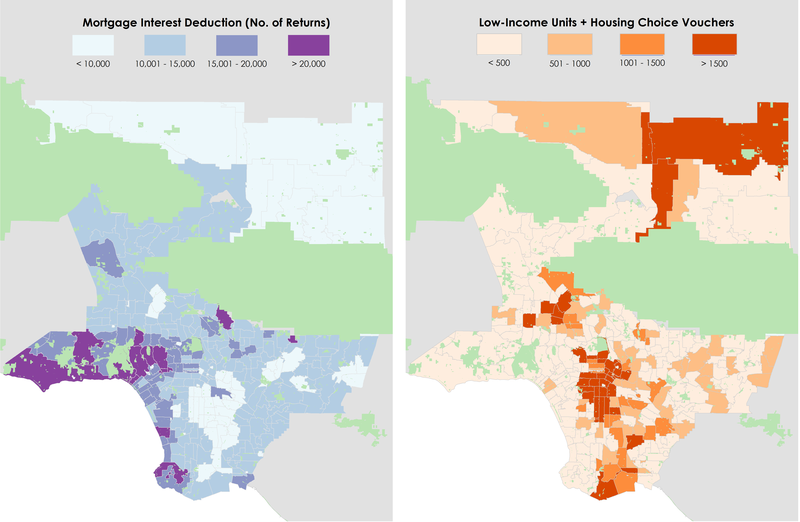 The maps in Figure 2 show where housing assistance is going in LA County by zip code. We combined the four low-income housing assistance programs together for simplicity, and because the numbers on some of them are so small. 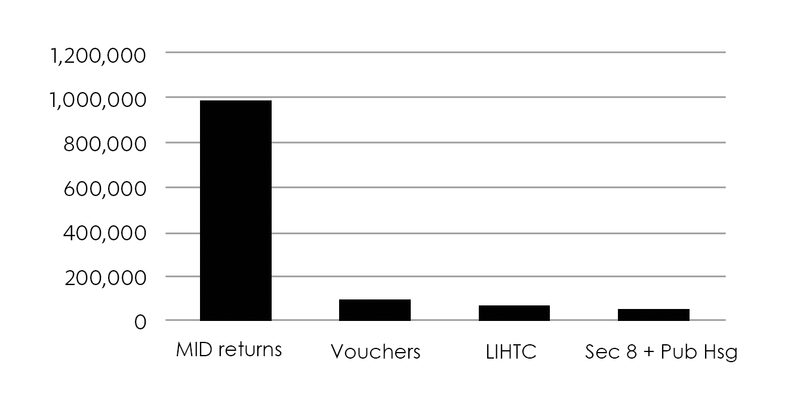 It’s important to note that many households used housing choice vouchers to live in buildings built under the LIHTC program, thus we are double-counting some of the beneficiaries. The difference in geographic location of federal housing assistance is stark. The MID disproportionately benefits higher-income coastal areas and hillside zip codes, while the low-income housing assistance programs are concentrated in the central urban zip codes of the county as well as outlying northern areas of Palmdale and Lancaster. The correlation between median household income and the number of mortgage interest returns by zip code is positive and strong, 0.4, indicating that many more households benefit in higher income parts of the city. Not only do many more LA County households benefit from the MID than low-income housing programs, with the benefits largely accumulating in high income neighborhoods, but there is also a vast disparity overall level of resources committed to the different programs. According to data from the Internal Revenue Service, county residents claimed more than $12 billion in mortgage interest deductions. Our rough estimate of the federal allocation to housing assistance for low-income households in LA County is less than $2 billion (excluding public rental housing, which would be a more complicated calculation based more on the opportunity cost of land, rather than an annual output on the part of the federal government). Eliminating the mortgage interest deduction would generate substantial new revenue for the federal government — in 2014, the MID cost the U.S. Treasury more than $100 billion. This revenue could be used to expand the housing choice voucher program, which cost less than $20 billion that same year, by five times. An expansion of such magnitude might actually allow us to cover all the households in Los Angeles County eligible for housing subsidies, and shift housing investment to parts of the county that have received consistently less federal support since the federal government began housing subsidy programs. Paavo Monkkonen is the Lewis Center senior fellow for housing policy and an associate professor of urban planning at the UCLA Luskin School of Public Affairs. Yiwen (Xavier) Kuai is a doctoral student in urban planning at UCLA Luskin. Sommer, K., and Sullivan, P., 2018. “Implications of US Tax Policy for House Prices, Rents, and Homeownership.” American Economic Review 108(2). National Low Income Housing Coalition, 2017. The Gap: A Shortage of Affordable Homes. Washington, DC: National Low Income Housing Coalition. U.S. Census Bureau, 2015. American Community Survey 2015 5-Year Estimates. McCabe, B., 2016. No Place Like Home: Wealth, Community and the Politics of Homeownership. London, UK: Oxford University Press.